The film was commissioned by the Icelandic band Sigur Rós as an experiment to connect their fans around the globe in one weekend of film and music. Valtari screened on all seven continents (including Antarctica) during the weekend of December 7-9. The screenings displayed 16 films that tackled Sigur Rós’s proposal to make a film inspired by their new album Valtari. Each of the filmmaking teams, a mix of professionals and amateurs (it's hard to distinguish between the two), received a “modest budget” and had creative license to take their cameras and let the music take its course. The project backfires, though, because it suggests that the music of Sigur Rós is rather uninspiring. I often like the band’s eclectic contemporary vibes, especially when it’s used in films, so Valtari disappoints with how little the filmmakers evoke feeling or excite the senses. 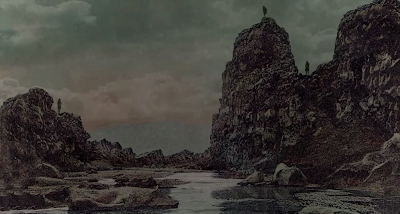 In spite of some formal variation, many of the shorts are limited to a range of two ideas: roughly half of them depict people writhing naked, while another chunk of the films are meandering shots of nature. Some of them have people writhing naked in nature if the filmmaker chose to double dip. Many of the shorts are forgettable. For example, did the Floria Sigismondi film even play during the screening? (I don’t recall seeing a film with John Hawkes and Elle Fanning.) Many of the other films blur together or are eclipsed by similar, but stronger, films. There are, however, a few standouts among the pack that are worth the experience, such as the animated long take by Inga Birgisdóttir and the humorous Heimlich instructional video by Ragnar Kjartansson. Especially good is the creative odyssey through a forest by Nick Abrahams, which stars a talking snail and a cute little fox. Best in the bunch is Christian Larson’s evocative contemporary dance number set to the title track “Valtari.” “Valtari” sees two dancers intertwine in a carnal kaleidoscope of bodily entanglement that twists and turns in sync to the hypnotic beat of the music. It might actually be the only short in the experiment to incorporate the music within the character of the film. The ultimate downfall of The Valtari Experiment is that the music of Sigur Rós eventually appears to be irrelevant. The films could easily be paired with anything from death metal to Willie Nelson and the result might not be much different. Similarly, it seems that virtually no effort was made in preproduction to distribute the playlist accordingly since tracks repeat themselves, with “Varúð” winning the contest with three plays. Valtari, the album, actually contains a mere eight tracks, so the experiment might have felt less redundant if it only had eight films. Flaws in filmmaking and artistic inspiration aside, though, Valtari could nevertheless create an artsy groove for Sigur Rós fans if viewed in a unique setting. The band’s notes for the experiment say that Valtari was to screen in mostly avant-garde venues, as opposed to the conventional screening it enjoyed in Ottawa. Rather than watch it in a crowded theatre, the strange experiment could bring out the full experience if enjoyed in, say, an art gallery, a nightclub, or a warehouse and in turn by enhanced by interactivity, alcohol, and/or hallucinogenic drugs. The playlist is online, so test it out for yourself and boo Shia LaBeouf if the setting warrants it. Sigur Rós: The Valtari Experiment screened in Ottawa at the Canadian Film Institute.